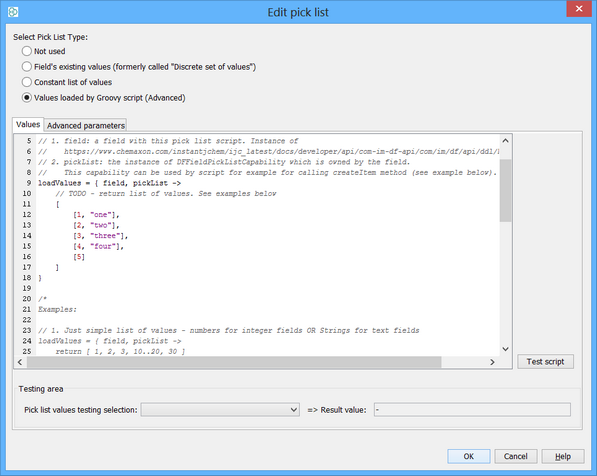 Pick list on fields supersede and enhance former "Discrete set of values". List of values can be bound to a Standard field. Those will be used as a template when editing or searching the field. Typical use case is when one field value is heavily used on multiple records through the database. This is exactly what you would expect from discrete set of values. But there are other advanced options to be setup on a field. The pre-defined values can be selected from the list if you query on the field in both, Query builder and Form based query. Also a value can be easily selected when editing or inserting a row. Under Edit Pick List... button you will find a dialog with several options. This is the easiest option. 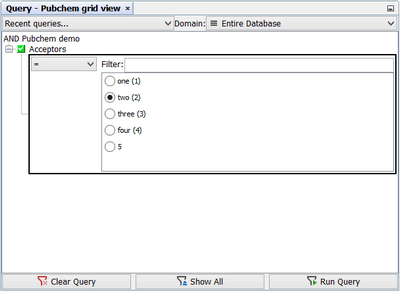 Pick list will access all the possible values in the field and make them available for selection. 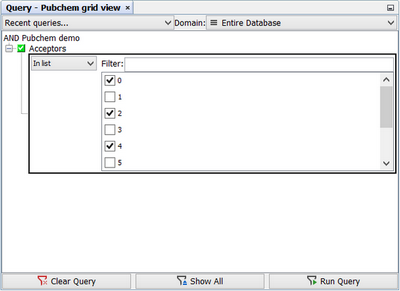 You need to load the available values from the database by clicking the "Load" button. As it would be too tedious to pick the value from the list while for example building a query, Pick List functionality also supports context searching for the values by simply typing. 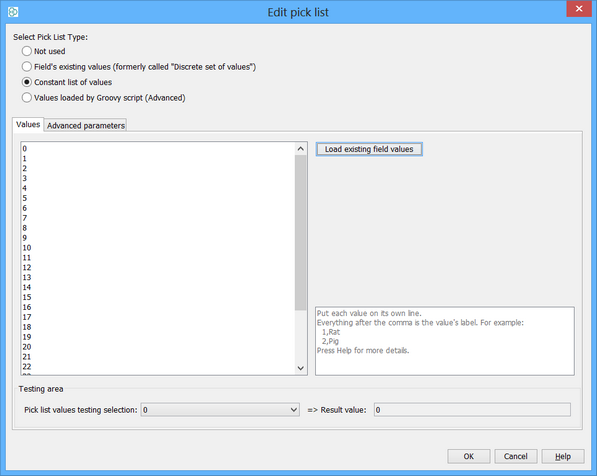 This option enables to set up only a discrete set of values to choose from. For example, setting up a Pick List for Acceptors field, which contains about 90 different numerical values, only those defined will be available in the Pick List. 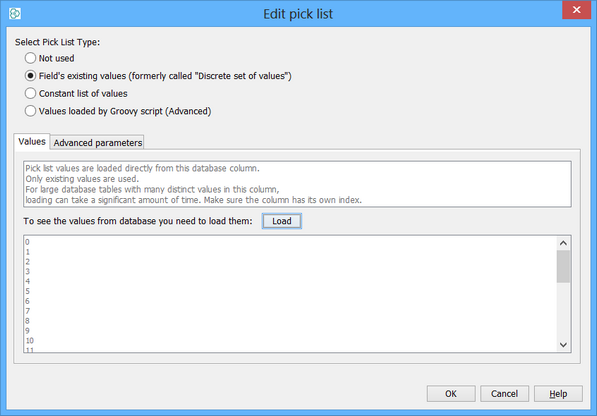 Setting up the Pick List with values loaded by Groovy give us more possibilities. One of the neat features is "aliasing" the values. See the example Groovy below. As you can see in the example, which was used for Acceptors field in the Demo Database, the code assigns only 5 values to be available (in analogous way to Constant List of values option). First four will be available in the Pick List by their string alias. The last one will be available as the value itself (in this case 5). The interface also offers a possibility to validate your Groovy script by clicking the "Test script" button. Next groovy example also allows to create obsoleted items. The createItem method is also an alternative way to create "aliased" values as seen in the first groovy example. // 4. Load values from other field from other or the same entity. See comments below. Other highlight of the functionality is that when "In list" query is used, the Pick List changes to checkboxes enabling multiple selection.